Today’s situation could easily have been much worse. I could have been injured, maimed, or even killed. If this happened to me, I imagine similar—if not worse—things have occurred to others in the highly-trafficked area. Indeed, worse things have happened. Salsiccia had his foot run over by a driver a few years earlier while he crossed Taraval from Safeway (fortunately, he only suffered some bruising). As Streetsblog previously reported, SFMTA data shows that 22 people have been hit getting off trains on Taraval just in the past five years. Please know that there is currently an intensive planning process happening to plan for future safety improvements along the L-Taraval, including proposals for boarding islands. Along with that have been other ideas for how we can properly train/educate drivers about slowing down near trains where passengers are getting on/off the trains, and stopping behind the train when this occurs. If that seems a bit wishy washy, there’s a reason. As previously reported, there’s resistance to boarding islands because they require taking away (or relocating) street parking. And this gets local merchants up in arms. San Francisco is in the midst of one of its biggest new-housing construction booms in history, projected to add 100,000 households and more than 190,000 new jobs by 2040. If everyone arrives with a car, that’s going to be a recipe for gridlock and economic stagnation. The effects on the environment, quality of life and pedestrian safety will be substantial. The city will grind to a halt. The growing research on the link between available parking and people’s decision to drive is part of the data the SFMTA, Planning Department, and San Francisco County Transportation Authority are considering as they work on legislation that will help shape future development in the city and provide incentives for people to get around without relying on driving alone in a car. The SFMTA piece makes a strong case: the more road space for cars and more free parking just induces more car trips, which uses up the parking, and results in more gridlock–and less movement of people. There’s only so much space on our streets. Providing parking for the sake of nearby businesses means less room for protected bike paths, transit-only lanes, wider sidewalks, street trees, boarding islands and safety buffers generally. And by creating more gridlock, free parking reduces the number of people who can access local businesses. The businesses, in the long run, get more patrons in their shops by making it easier to walk, bike and take transit. “Did anyone ever tell them that foot traffic to their stores would increase if people are walking by instead of driving by?” asked Salsiccia. But businesses, meanwhile, don’t buy it, and are convinced eliminating or greatly reducing parking will destroy them. But studies show they’re just wrong. Moreover, the busiest, most vibrant, most economically vital streets in the world have no street parking. Take London’s Oxford Street, or Kalverstraat in Amsterdam, or go no further than stretches of Powell and Market that have severe limitations, albeit often unenforced or watered down, on through traffic and street parking. If the businesses on Mission or Taraval are convinced that reduced parking kills their bottom line, then they need to provide hard evidence. 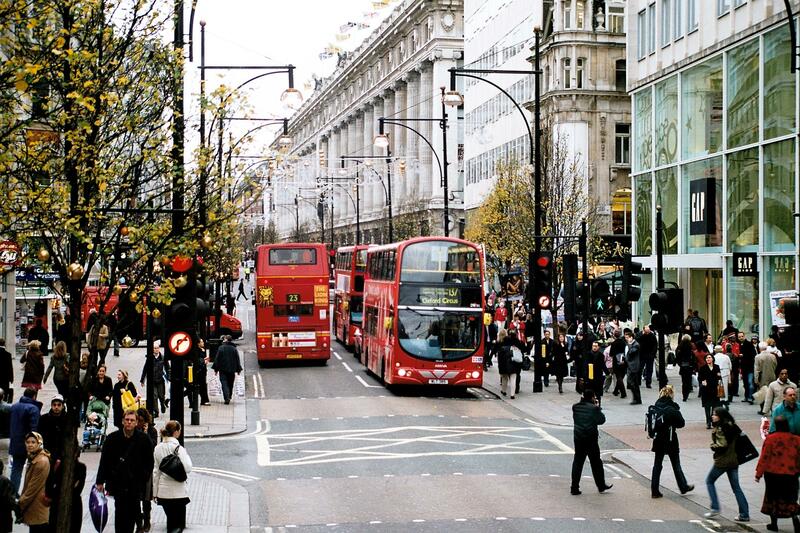 Oxford Street is one of the busiest, most successful retail streets on the planet, yet it has no parking and transit rules the street. (Maybe this is a situation where there really is no room for bike lanes). Image: Wikimedia Commons. No parking lanes on the Leidsestraat in Amsterdam. In fact, no lanes at all. And yet retail thrives, even on a blustery winter day. Photo: Streetsblog. What about deliveries? Certainly, this has to be dealt with. As reported previously, Mission, with its new transit-only lanes, still has loading areas reserved for merchants. 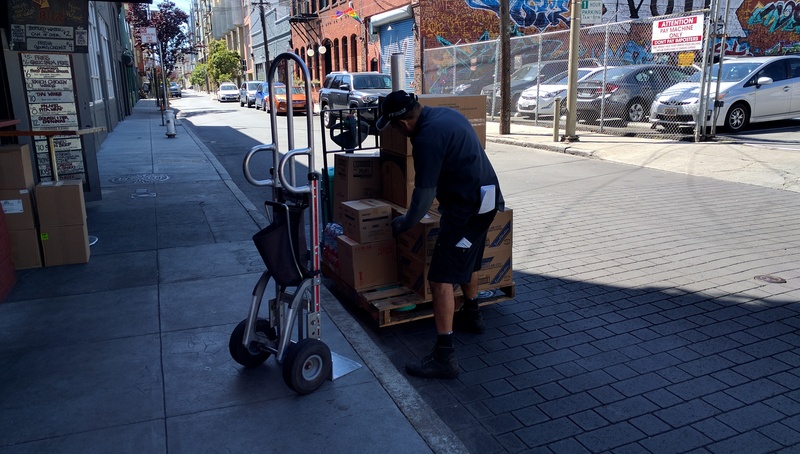 And on some of San Francisco’s oldest, narrowest streets delivery truck drivers manage, such as this one who is delivering beer to a bar on Natoma Street–he left his truck parked legally around the corner. Still, parking preservation seems to be the main political impediment for major transit and safety improvements. It’s even got the occasional transit advocates convinced that there isn’t enough room for bike lanes. When anyone says “There isn’t enough room for bike lanes/boarding islands/transit-only lanes” one has to unpack that statement. They’re really saying: “every street must have parking.” Which, if anyone does the math on it, is an incredibly inefficient use of space. 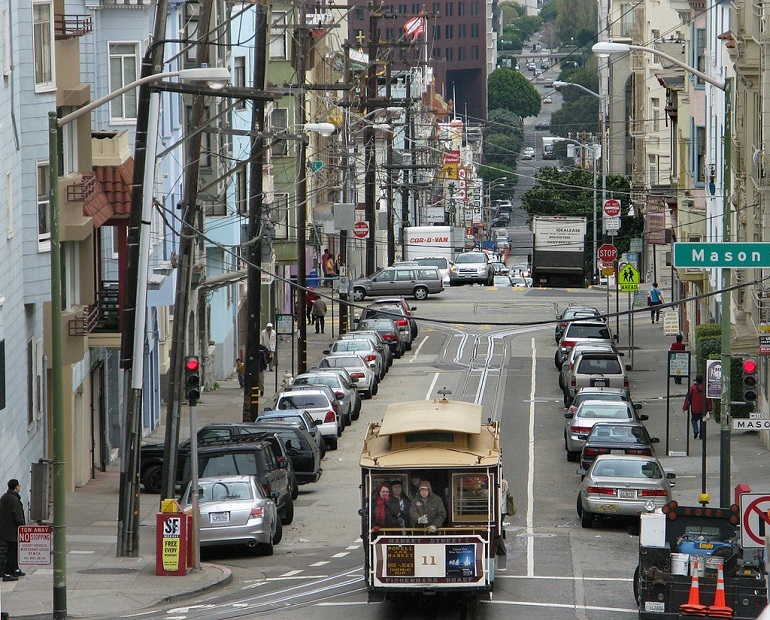 Just look at this photo from SFMTA and the massive amount of invaluable San Francisco real estate being used by some 20 parked automobiles which are stationary 95 percent of the time and carry fewer people than a single, 126-year-old cable car. It doesn’t mean all parking should be eliminated everywhere. But in dense corridors parking can be shifted to side streets as perpendicular parking, as is being done with several SFMTA street improvement projects. Or perhaps it’s time to encourage narrow, multistory, for-profit parking storage, using parking elevators to store many cars on a small footprint, with rates driven by demand. Of course, that means car storage will actually become too expensive for most drivers. But that’s better than the entire society bearing all the costs and associated dangers. This story is a blatant provocation of Bob Gunderson. What about deliveries? Certainly, this has to be dealt with. Copenhagen’s solution for deliveries to businesses on pedestrian-only streets is that they’re restricted to certain morning hours when there aren’t as many shoppers, and the speed limit is ~5 MPH. The notion that this “harms businesses” is insane — their pedestrian streets attract so many shoppers it makes Valencia Street look like a ghost town in comparison. my first thought was which Muni yard is this? 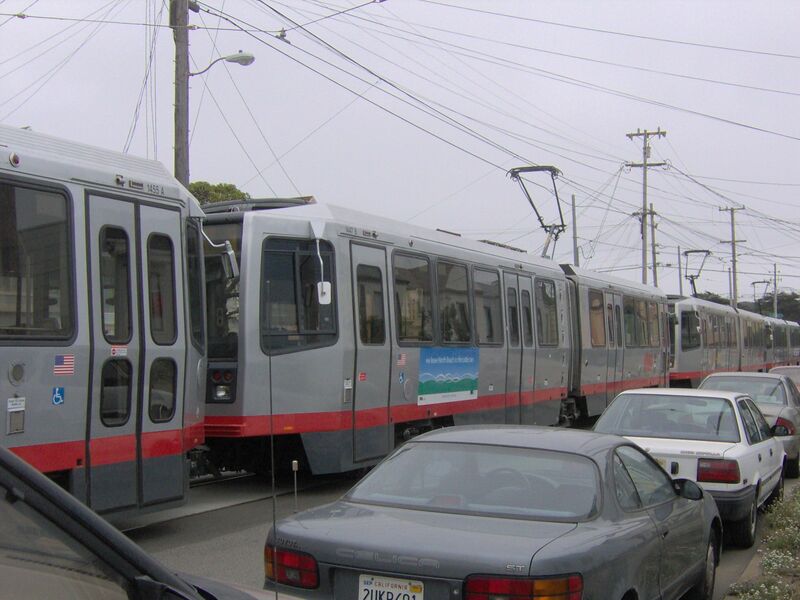 (as in storing broken Bredas) and Muni worker cars in the foreground? I know Marco Salsiccia through a mutual friend. Worlds collide! Federal ADA law requires platforms at light rail stops. Even “grandfathered” stops have to get platforms if any significant work occurs on the street. So they will all inevitably have to be brought into compliance. To do otherwise, the city would be inviting really expensive lawsuits in Federal court. The City should build those boarding islands as soon as possible or risk facing a slew of wrongful death lawsuits brought by the families of those passengers killed or maimed by inattentive passing drivers. Don’t forget that the merchants along Tarval (ex: Great Wall Hardware on 28th) fought the idea of boarding islands. The guy that owns Great Wall even got up that shitshow open house recently and was quoted by the Examiner. As Drunk Engineer notes, infrastructure that pre-dates the 1990 ADA act is grandfathered. They only need to be made ADA-complaint when there is a major re-design, which of course makes such re-designs more expensive and difficult, which in turn explains why the pace of street redesign is slower than many here would like to see. As for lawsuits, that is what driver insurance is for. And what about the disabled person who can no longer park outside her home and gets killed because she has to walk 2 blocks? We still live in a democracy, which also means that while people could agree on some principles (including vision zero), they may and can still object to specific implementation. Like it or hate it this is part of the system. The thing is that our lifestyles and economy has changed. In the old days when the streetcar suburbs were built, a 1 car garage was good enough because at most the head of the household (a man) would drive if not taking the streetcar, the women and children could be transit dependent. If you look in the historic images there were no street parking way back then. Today we have two income households. We send kids to schools where they cannot walk or bike to. May be one of the residents could have a job in downtown where he or she could take transit, but the other might have a job in the suburbs where it is not easily transit accessible. That’s a nice sentiment but it clearly isn’t true. SFMTA have a number of conflicting priorities, of which safety is one, traffic throughput is another, costs and revenues yet another, and so on. As a statement of intent to increase safety it is fine. But as an absolute imperative, it is simply false. We’d need 5 mph speed limits with zero tolerance policing to enforce it, and I doubt that the votes are there for that. Sure but they are all smack in the downtown of cities, where car ownership and use is at its lowest. Tang’s district, along with Yee’s and Avalo’s, are the most suburban-like and car-centric in the city, because of their distance from downtown and the relatively poor transit. In fact in zip code 94116 in Tang’s district, more than 50% of commutes are by a single driver in a car. Throw in car sharing, car pooling and cabs, and over 2/3 of her residents rely on cars on a daily basis. Not the best place to start banishing cars. Market Street is. Not exactly. It’s true that only about 40% of voters supported Prop L calling for more balance. However that was only ever going to be a non-binding policy statement, i.e. had even less relevance than “Vision Zero”. It is fanciful to infer that the 75% or so of voters who live in a household with at least one car (and probably more like 90% in the Outer Sunset) are demanding eradication of street parking. Good points, Andy. SF’s school busing (sorry, allocation) system ensures that there are thousands of extra car journeys each day because students cannot be allowed to attend their closest school as is the case in most of the nation. As you note, we still live in a democracy. Nonsense! Our mayor will defend our motoring way of life! I don’t know if there’s any way this post could do justice to just how reckless the SFMTA is being along Taraval to increase parking instead of adding boarding platforms. With the boarding platforms, riders like Marco Salsiccia would be protected from trafric and with the parking reconfigured at the adjacent corners the SFMTA was able to add a net of +13 spaces. Yes the SFMTA had still been planning to add parking, but only a little and in exchange for a big win with safety and Muni service. Some of the most petty complaints Streetsblog has reported earlier was merchants believed walking from a few dozen yards from the corner was too far for their customers. One suggestion was Muni riders should wear light colors or something reflective. But the merchants’ incredibly selfish demand for parking immediately in front of their businesses. As though the spaces immediately in front are reserved for only their customers? So the SFMTA caved to merchants and 5 of the boarding platforms have been put on hold, and the SFMTA is going to run a pilot project where Muni passengers will still have to exit into a traffic lanes, but they will be covered with a high-visibly cross-hatched pattern designed by the local merchants. The parking count also goes up by 40 instead. I’ve attached screenshots from the linked presentation (PDF) explaining how the criteria or reconsidering boarding platforms is another crash has to happen first. It should be shocking to everyone Mr. Salsiccia’s near catastrophe isn’t enough reason for SFMTA to move forward with the original boarding platform plan. Taraval has already been identified as one of the most dangerous streets, it’s terrible the SFTMA is demanding another person be sacrificed to double-check that exiting trains directly into traffic is dangerous. Here is the Chronicle (subscription) article covering the increase in traffic deaths since Vision Zero and lettering merchants redesign the L-Taraval project. The worst part of this is that if/when the pilot proves to be a failure, and SFMTA comes back to install boarding platforms at those five stops, the merchants will fight this with the narrative that the evil SFMTA is taking away 27 parking spaces. The fact that SFMTA recently added 40 parking spaces to the corridor, and that there will still be a net gain of 13 spaces with the final five boarding islands, will be conveniently forgotten. A complaint I have seen from Mission businesses is that many of their customers are former residents who have been displaced to far-flung areas with poor transit, so that if they want to come back to the old neighborhood they have to drive. I would love to see some data on this, though I doubt that exists. But it does point to the need for more peripheral parking structures, especially at the endpoint BART stations. Vision Zero, or Vision “once more people get hit we’ll do something safer”? Is a disabled person walking to/from their parked car more or less or just as likely to get killed by inattentive drivers than one walking to/from their transit stop? > eradication of street parking. Sure it is, and what’s more no one is making that inference. STRAWMAN! This argument is just another version of the argument about residents who were displaced coming back to go to church. I give a lot more credence to the church argument. The church argument was always prefaced that pretty much everyone driving back was far too infirm to take transit. If the city goes forward with substandard design simply to save on street parking, we as taxpayers, may well be opening ourselves up to significant liability (since ultimately it’s us who pay the legal bills), particularly given the fact that motorist insurance is woefully inadequate in covering medical injury costs for people who get hit by drivers. Just like all those new parking spaces along Mission where the SFMTA eliminated Muni stops. Excuse me, but the entire thrust of Roger’s piece is about how free “storage” (he means parking) is something that should be removed. I gave Roger credit for backpeddling on that over-broad goal towards the end of his piece, but pretending that wasn’t the theme here is disingenuous. It’s in the title! I doubt if anyone can put a number on that. But it misses the point. Every change potentially makes the road safer for one class of people but more dangerous for another class. Disabled people typically need to park close to their destination, which is why we have disabled parking zones and parking stickers to allow that. Cherry-picking one disabled class against another is probably neither an effective nor honorable way to determine what is best here. It’s not just about deliveries, however. In a street like Market Street or the other examples given, it might be, as few people live there and there are not any or many driveways and garages. But in an area like Taraval, the commercial strips are low-rise, with many residential structures as well. 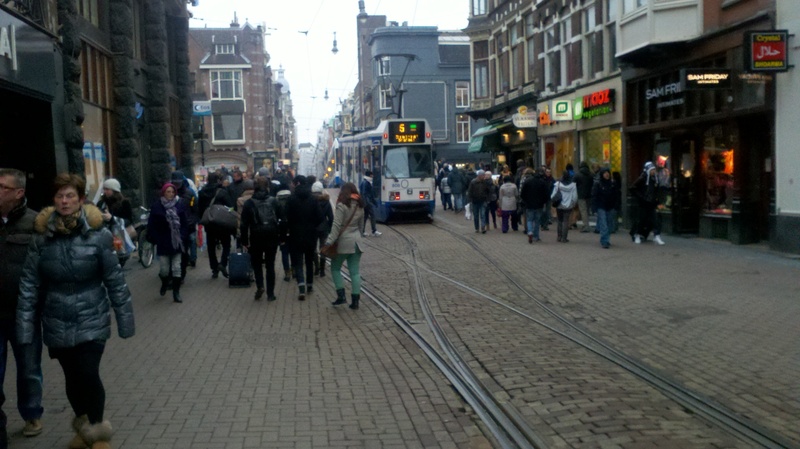 It is hard to pedestrianize a street where the residents need vehicular access to their buildings. Even on the block of Duboce by Church, cars were only banned in one direction because there was a driveway on the other side. And then there is a need for cabs, shuttles, emergency vehicles, FedEx deliveries, disabled vehicles and so on. The reality is that it is not possible to pedestrianise many streets at all, no matter how desirable you may think it is. The problem is that is an argument to make no change at all. If the city makes a change and then somebody dies there, then there is a liability. But as long as the city changes nothing, then nobody can blame the city for what it did. So if being paranoid about lawsuits is the criterion (and how sickly American is that) then the fear-mongering around this will simply confer paralysis on the city. And it is already hard and expensive enough to make changes. As DrunkEngineer also notes, pre-1990 infrastructure has a grandfathered exemption from ADA. But if you make changes to it then the entire weight of ADA comes down on you. And who was a major funder and lobbyist for ADA? Trial lawyers, of course. So paradoxically ADA may be slowing down street redesign. School choice is a good thing, and so is desegregation of student school bodies. Transportation impacts are a secondary concern to both other goals, if it requires a fleet of school buses, so be it. Street parking can be useful if (a) it’s metered, and (b) the metered rates are high enough to keep it fluid, with spaces open most of the time. This allows for short-term parking, which is by far the most valuable for motorists (for pickups, drop-offs, short errand running, short shopping trips, or even meals). If, as a city government, you have people parking their cars in the same street parking spot all day or all night, you’re doing it wrong. That’s what private garages and driveways are for. If they really believe the church argument, they should have hundreds of handicapped spaces next to each church. In New York City, for the most part, the students are simply told to get on the subway or the bus. There is no need to send thousands of cars around to move students to the school they are going to. Younger students do get yellow school buses. San Francisco can do the same thing. It is, however, possible to get rid of free street parking. Delivery zones; short-term (15 minutes) parking; drop-off/pick-up zones; etc. Those are more valuable than free street parking. The only place I’ve ever seen automobile parking referred to as “car storage” is in Streetsblog postings. To most Americans outside of SB-land, “car storage” means a lot, usually in an industrial area, where inoperable vehicles (sometimes called “project cars”), travel trailers and motor homes are stashed. It’s not a yard shot – it’s a street shot out near the zoo.